Short walkthroughs for some sample SOPs. 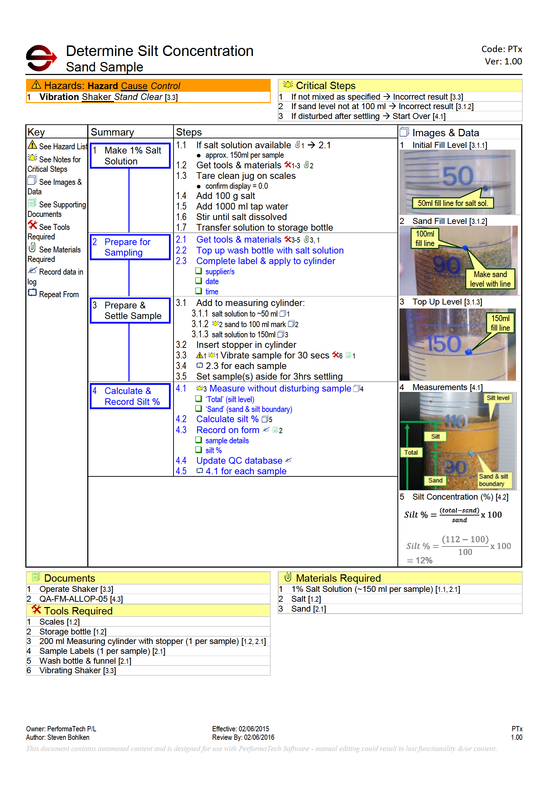 This is an example SOP from a laboratory for a concrete tile manufacturer. 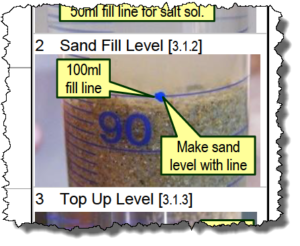 It covers the main steps for measuring silt in sand. A Standard Operating Procedure is basically a list of steps. In this SOP each step is written as a command. Using command language makes the SOP easier to read. Command language tells people ‘what’ and ‘how’ – which is exactly what is needed in a SOP. The steps are chunked into groups. Chunking makes steps easier to remember. It also helps people to find the information they need, quickly and easily. Each group of steps is given a name. Information that is not an ‘instruction’ is grouped into tables. These tables are called ‘Supporting Information Tables’ (SIT). Supporting information tables help keep the ‘why’ out of the instructions. 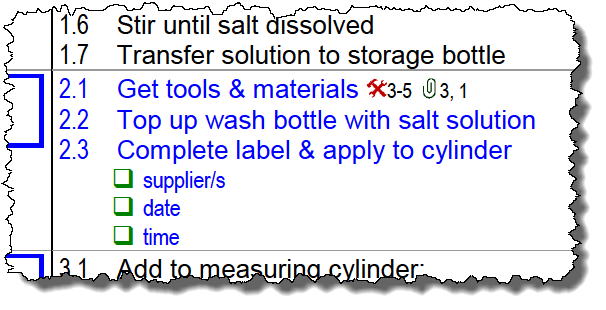 In this example SOP critical steps are identified by a symbol. This makes the critical steps easy to find. 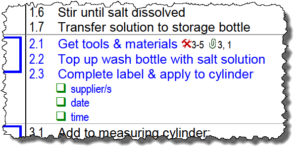 Putting the critical information in one place makes it easy to review before starting the task. Pictures are a great way to communicate information and reinforce learning. We chose this SOP as our example SOP because of the pictures. The pictures used in this SOP add ‘value’. They show ‘how’ to use equipment and do calculations. These pictures show how a SOP can reduce errors. This Standard Operating Procedure was written using TRIM-SOP™ software and templates. TRIM-SOP™ does the formatting so you can focus on content.